The Cave of Castania is not the largest in Greece nor the easiest to visit. The road to Castania was somewhat difficult, but recently local authorities repaired it, widened it, and added new sections that have made getting there easier. A visitor has the choice of driving to the Cave from the charming town of Neapoli, near the southern tip of Peloponnesus, or by taking a short boat ride from Monemvassia - another geological wonder - a few miles north of Castania. 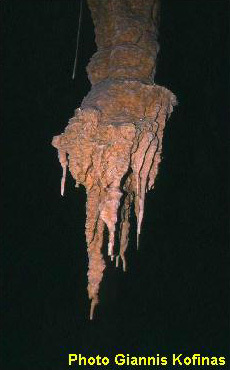 To this day, the true size of the Castania Cave is not known since it has not been extensively explored or studied. It may be as large as that of Diros or other caves of southern Peloponnesus. However, it is not size that makes this cave at Castania so unique. What makes this cave different - and a true speleological wonder - is the abundance, richness and diversity of truly unique stalactitic and stalgmitic forms that nature has created and decorated it. Sattelite Photo of Peloponnesus, Greece. The Cave of Castania is on the easternmost peninsula which ends at Cape Maleas - a site where numerous ancient shipwrecks have been found. 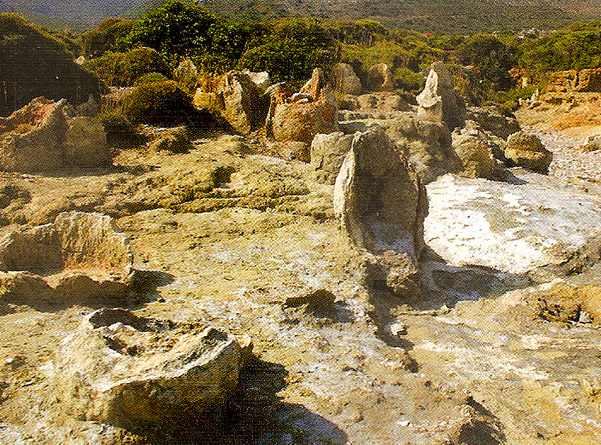 The town on Neapoli is only a few kilometers from the Petrified Forest at Cape Maleas. 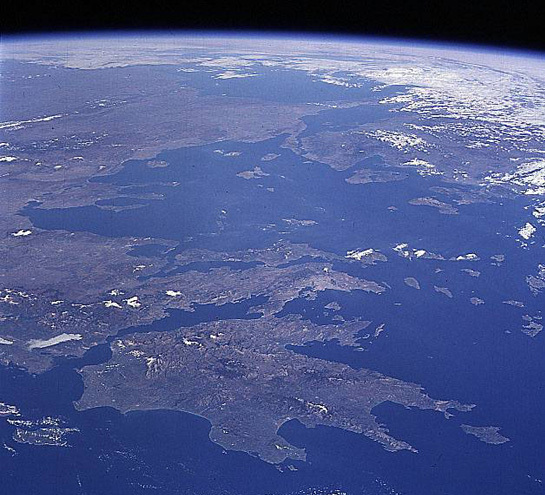 The Island of Kythira is at the lower right of the satellite photo. The Cave of Castania is a magical place that is difficult to describe with words. One needs to experience it to fully appreciate it. Upon entering, the visitor leaves the reality of the surface world and starts a journey of transformation in a mystical setting below where mythical forms and ever-evolving shapes created by nature, become an adventure into a world of fantasy and poetic interpretation. Here, the eternal silence that has lasted for millions of years is only interrupted by the slow and almost imperceptible drips of water, which, drop by drop over eons of time, have sculptured fantastic works of art, in amazing combinations of colors and shapes. Although relatively brief, the visitor's path inside the Cave of Castania meanders gracefully - down - up, down up and then up again. The walk is comfortable and full of wonders. Glistening textures of stalactites and stalagmites of all sizes and shapes reflect the lights that outline the visitor's path. Additional lights placed throughout the cave reveal gently the large range of triumphant colors forms and textures that nature created over thousands of years. One must move slowly, carefully, pause frequently, and look around with reverence, so that some miracle of vision, beauty, or fantasy may not be lost by undue haste. A very knowledgeable Greek guide - explains in both Greek and perfect English the facts and the history of the Castania Cave, and how a local shepherd accidentally discovered it. She tells the story of how this shepherd watched bees enter and come out of a crack in the rocks of his field and how, his need for water, prompted him to break open the fissure, only to discover this beautifully unique and rare cave full of brilliant stalactites and stalagmites. 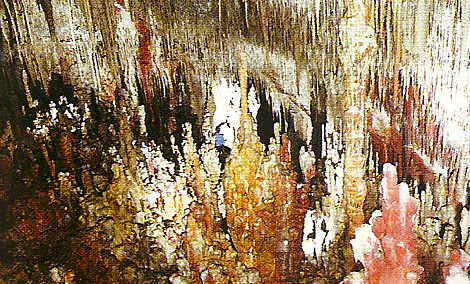 The guide points out unique forms and shapes of interesting stalactite formations and tells their acquired descriptive names. Seeing these formations makes it easy to understand why they were so named. 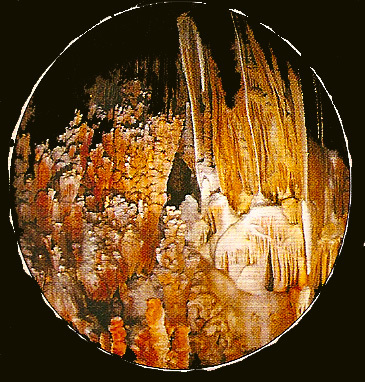 One does not have to be a speleologist or geologist to appreciate the magic forces of nature that have shaped these forms in the formations and have created this mythical Kingdom of the Cave of Castania. At this magic place everything seems possible and all ancient Greek myths become readily believable. Indeed there must have been twelve gods living on Mt. Olympus and hundreds more elsewhere, and some must have wondered south to help nature create the Cave of Castania. The only regret a visitor will have at the tour's end is of leaving this Cave of Castania. However, the fantastic forms that have been seen and the magic that has been experienced will be forever etched in memory - for as long as one lives. HOME TO PALEOLITHIC AND NEOLITHIC PEOPLE? Archaeologists and anthropologists have determined that quite a few of the caves in Greece were inhabited during the Stone Age - some of them continuously. The earliest evidence of such inhabitation goes back to 35,000 B.C. (Upper Paleolithic) ago. More concrete evidence begins at about 20,000 B.C. (Middle Paleolithic). Finally, the latest finds are from 4,000 to 3000 B.C. (Final Neolithic). There is concrete evidence that in the late Neolithic period, about 4000 - 3000 BC, many of the people inhabiting this southern region of Greece, used caves for their homes, workshops and as cemeteries or as places of worship. Not too far from the Cave of Castania, at the caves of Diros, vases and bones from various periods were discovered some years ago. These findings indicate that Neolithic people in this region maintained complex communities and engaged in trade, farming and maritime travel - among many other activities. Also, human skeletons found in some of the caves, have led to the conclusion that perhaps some of these Neolithic people were killed or entombed when the cave's entrance or ceiling collapsed following strong earthquakes. Strong earthquakes are quite common in this area of Greece. There is evidence of extensive landslides, rock falls and past catastrophes near the Cape Maleas and Cape Tenaros in southern Peloponnesus. 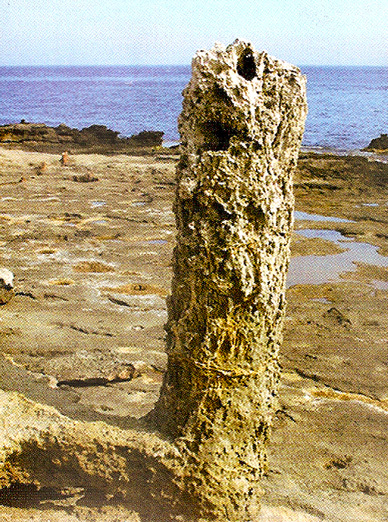 There is even a petrified forest of palms at the edge of the sea near Cape Maleas, which indicates not only geological changes but climate changes as well. There is also extensive evidence of extensive subsidence and of ancient settlements under the sea in the general area. Whether the Cave of Castania also served as home to Neolithic people is not known at this time, since only a small section of this geological wonder has been so far explored. Future searches may determine the true size of the Cave and perhaps lead to important palaeontological discoveries on whether ancient Neolithic cultures of this region also used it. 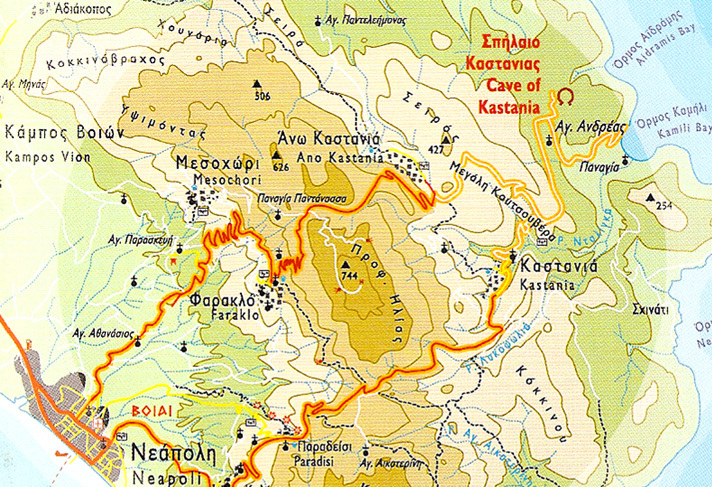 Greece is located in a very complex geologic region. During most of the Triassic (245 to 208 million years ago), Jurassic (208 to 144 million years ago), Cretaceous (144 to 66.4 million years ago) and even in the latest periods of the Mesozoic Era, the eastern region of the Mediterranean basin was an ancient, shallow, oxygen-rich, sea. With continuous submergence, thick layers of limestone formed on the floor of this basin. Active tectonic interaction and collision of the converging African and Eurasian plates along the entire eastern Mediterranean margin resulted in extreme seismicity and volcanism -processes that continue to the present. 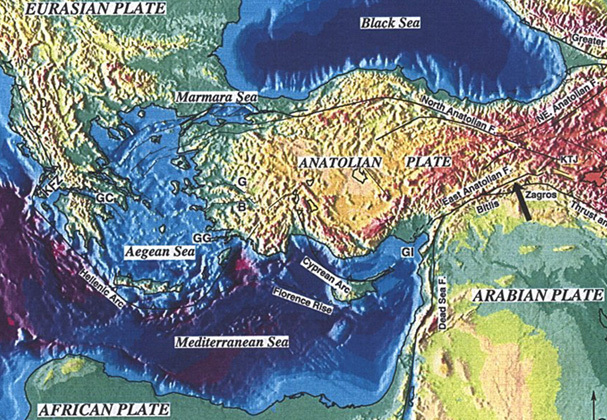 The Hellenic Arc - Three major tectonic plates, the Eurasia, Africa, and Arabia plates meet in the eastern Mediterranean and have formed broad boundaries of seismic and volcanic activity. Greece is located near the boundary of the two great lithospheric plates of Africa and Eurasia. The interaction of the great plates results in numerous earthquakes. A zone of active seismicity extends along Western Peloponnesus and continues along the islands of Kythera and Antikythera to south of Crete, then to Rhodes and Western Turkey. Paralleling the Hellenic Arc is the volcanic Arc which includes the volcanoes of Methana, Milos, Santorin and Nisyros. The plate movements and the associated earthquakes have also formed a series of sea basins extending from Kefalonia to Rodes. (Map modified after Nafi Toksoz of MIT/ERL). Many caves have partially collapsed because of earthquake activity in the region. The earthquake of 365 A.D. in the Kythera Strait is believed to be the strongest historical earthquake that ever occurred in Greece. It impacted the greatest part of the Roman empire. Knossos on Crete was destroyed by the earthquake. There was heavy damage from the earthquake at Gortyna and in Patra and throughout the provinces of Ahaia and Viotia on Peloponnesus. Skandia, the ancient harbour of Kythera on the east side of the island , was destroyed by the combined effects of the earthquake and the tsunami. During the Cretaceous period (between 144 and 66.4 million years ago), continuing tectonic processes resulted in the Alpine Orogeny - a still ongoing process of - and the formation of the Alps, where marine sediments and fossil organisms can be found, even at the highest elevations. During the Cretaceous period, the stresses of the great colliding tectonic plates lifted and folded the upper limestone layers as well as the deeper metamorphic rock layers of the Eastern Mediterranean Basin. Big landmasses eventually begun to emerge from the sea, and formed the Greek mainland and some of the islands of the present Aegean and Ionian Seas. The uplifted and folded masses consisted primarily of limestone and of metamorphic rocks. With the passage of time, these upper layers of this land mass partly eroded. Subsequent hydrothermal intrusions led to the formation of large crystalline rocks, ample metallogenesis of manganese, iron and aluminum, and the formation of large coal deposits. Tectonic processes continued to stress and fold the earth's upper crust in the region, thus forming more islands, more mainland mass, and lifting the mountains of Greece to greater heights. About 65% of these upper surface layers of the uplifted area of Greece consisted of limestones. 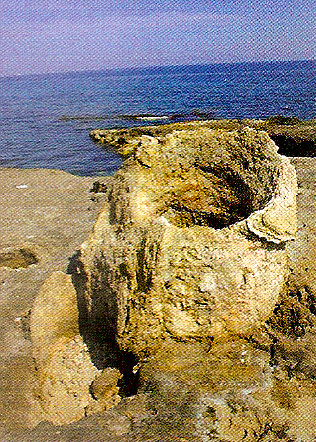 Subsequently, during the Tertiary (66.4 to 1.6 million years ago) and Quaternary (less than 1.6 million years ago) Periods, but particularly during the Pliocene Epoch of the late Quaternary, karst phenomena (due to erosion by water) begun to take place throughout the present Eastern Mediterranean region. Karstic action - that is erosion by water - begun to carve thousands of huge subterranean caves deep into these limestone layers of Greece. And this is how caves like Castania were formed. Eons of time later, the continuous slow penetration of water from the surface begun to further sculpture the wondrous forms or stalactites and stalagmites in these caves.